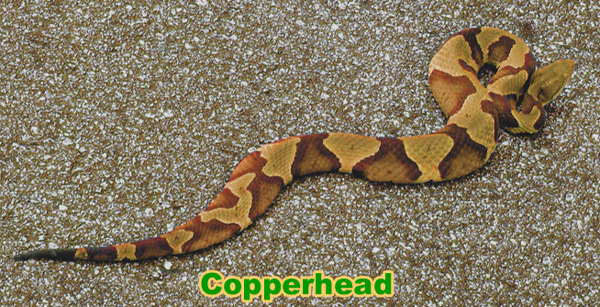 The Copperhead is one of the most commonly mis-identified snakes in the United States. Many types of snake, especially the Northern Water Snake, the Banded Water Snake, and the Brown Water Snake are mistaken for the poisonous Copperhead. Although you can try to learn tricks, such as looking for an elliptical eye pupil (venomous pit viper) instead of a round pupil (harmless), your best bet is to click on the below photographs to take a good look at what the snake looks like, and get the image firm in your mind, so that when you see it, you'll know for sure. The Copperhead (Agkistrodon Contortrix) is one of the venomous snakes that can be found in the east and primarily south east of the United States, and just the northern part of Florida. On this page I have maps showing the Copperhead Geographical Range. The name is certainly an accurate description for this species. Like many of the snakes native to the United States the Copperhead has a fairly stable population, and most people will come into contact with these snakes while walking or working in woodland areas. 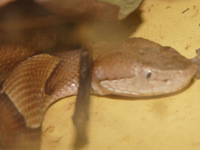 Although the Copperhead is a venomous snake, it is unlikely that a bite would actually be fatal as their venom isn’t particularly highly concentrated. The reason that the Copperhead gets its name is largely for the color of the snake, which will vary from a combination of light and darker brown patches to a similar pattern in a reddish brown color. The variation will often depend on the habitat in which it is living, as the key reason for the color is that it is an excellent camouflage while slithering through dried leaves and ground litter in woodland areas. This species isn’t as large as some of the more feared species of snake, with most Copperheads being between a foot and a half and three feet in length once they have reached maturity. The body itself is quite heavy, but it does narrow before getting to the wide head of the snake. Like many of the other snakes in the ‘pit viper’ family the Copperhead hunts by lying in wait for its prey and then pouncing when it is close enough. It will then strike and sinking its teeth into the prey and injecting its venom into the victim, before releasing it and following the prey until it dies. The majority of the diet of the copperhead is made up of small rodents and mammals such as voles and mice, although they have also been known to eat insects and frogs. There are also instances where there have been Copperheads observed climbing into the trees in order to eat young cicadas. Like many of the venomous snakes of the United States, the Copperhead has a reputation for aggression that is simply inaccurate. One of the defense mechanisms of the species is to stay entirely still and wait for the threat to pass. 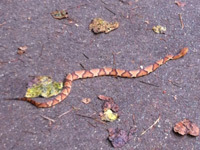 What this means in many cases is that people walking through woodland will accidentally step on a Copperhead, which will then bite the individual. Because of their significant population and tendency not to flee when a person comes into the area, the Copperhead is the snake that does make up the highest proportion of snakebites in the United States. Fortunately, the venom isn’t strong enough to kill in most cases, but it can still be very painful and damaging. In terms of the habitat that the Copperhead prefers, it will normally be found living in deciduous woodlands where the leaf litter offers excellent hiding spots. Like many other snakes it also enjoys basking in the sunlight, so in many areas it will often be seen on or around rocky outcroppings that provide a great location to catch the sun. The Copperhead actually has quite a large range, going from North Mexico and can also be found in over half of the states in the south and east of the country. In North Carolina the Copperhead is well known as a snake that explores gardens and wood piles, which is why many people are cautious of the species. The mating season for the Copperhead is generally in the spring and fall, and like many other pit vipers the female can carry the sperm until a favorable time. 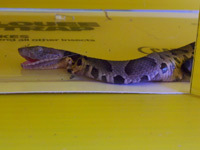 The female will not breed every year, and while most litters are between four and eight young, there can be as large as twenty young Copperheads born. These young snakes are between six and ten inches in length, and are born with fangs and venom as they are left to begin their lives without the mother shortly after being born. These young snakes are colored in much the same way as the adult copperhead, apart from a green or yellow tip to their tail which is used to attract prey which will see the tail wriggling and believe it is a worm. These young snakes will grow rapidly for the first two years, and are usually around eighteen to twenty inches in length by the time they have reached two years old, when they will become sexually mature. The life span for the Copperhead in the wild is quite low, with very few snakes living beyond seven years, although there are rare examples of a Copperhead with an exceptional life span of up to thirty years. The Copperhead is a snake that will continue growing throughout its life span, and the older snakes will tend to be longer and heavier, and these male snakes are also favored by the females as they tend to win any mating fights.